The world wide known ex-Beatles member, Paul McCartney will give a huge show in Oslo in the summer of 2015. 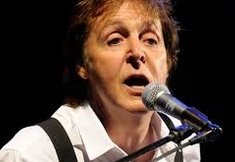 Paul McCartney is an English singer and songwriter who was one of the members of The Beatles and who is also one of the most outstanding and most influential musicians of our time. Since May 2013 Paul McCartney is on a world tour which will end in July 2015. With the Out There tour McCartney will give several shows all across the world. There will be 43 concerts in North America, 13 in South America, 12 in Asia, 1 in Central America and 14 in Europe. At the concert McCartney will perform some of the most famous Beatles songs such as the Let It Be, Hey Jude, Yesterday, Blackbird and so on. In Oslo the Paul McCartney concert will be on Tuesday on the 7th July 2015 and it will take place at the Telenor Arena and on Thursday on the 9th July 2015 McCartney will be on stage in Stockholm at the Tele2 Arena. Tickets for the concerts are already available, and can be bought using the link further down on this page!